Since we launched our cash account, we’ve been asked one question far more often than any other: how are we able to get you 2.24% APY interest on your money, especially considering that traditional banks only pay 0.10% APY on average? The answer is simple: Those banks are able to pay more, too — they just don’t. We get you more, in short, because we’re not greedy. Banks could easily pay rates comparable to 2.24% APY, but they don’t because they have learned they can get away with it. To understand why banks could pay more, you need to understand how banks make money. Consumer focused banks use deposits as the source of money to make their loans, which means their profits are primarily determined by the interest earned from consumer loans (primarily home equity lines, otherwise known as HELOCs) minus the interest paid on cash accounts. Bank profit margins grow when the interest rates they charge on loans increase faster than the interest rates they pay on deposits. 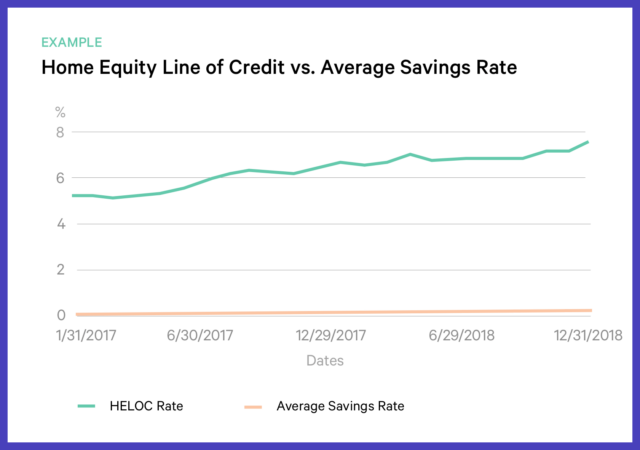 This is illustrated in the graph below that plots average interest rate banks charge for HELOCs compared to the average interest rate they pay on savings accounts. As you can see, banks increase the interest rates they charge every time interest rates are increased by the Federal Reserve. The interest rates banks pay have effectively been the same for the past 10 years, a timeline that begins when banks lowered interest rates to zero as a result of the financial crisis and learned they did not lose depositors. 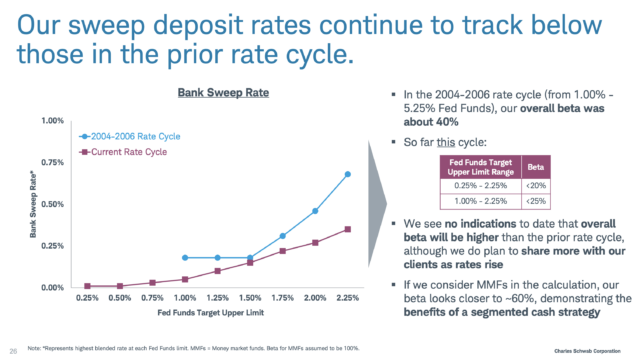 Even worse, banks are not at all embarrassed to admit they want to further increase the spread between the rates they charge and the rates they pay. Below is a slide from a recent Charles Schwab investor presentation. It shows that they have passed along to clients a much lower percentage of the interest they’ve earned this decade vs last decade and that their expectation is to continue to do so. In fact, Schwab has made a point in every one of its recent investor conference calls that they intend to generate expanding margins as interest rates rise. If this model just doesn’t feel right to you, you’re not alone. This is the core of why most consumers hate their banks. More and more people are aware of the role they play in generating massive profits for banks, with effectively no benefit to them. This is why banks are so hated, and it isn’t just a vague feeling in the air. This growing dissatisfaction from consumers is reflected in banks’ Net Promoter Scores (NPS). NPS is the best way to measure the likelihood a consumer will recommend their vendor to a friend. It is calculated by asking a consumer to rank the likelihood they would recommend the vendor on a scale of 0 to 5, with 5 being the highest score, and then subtracting the aggregate percentage that score 0 to 3 from the percentage of people who ranked the service as a 5. A score of 75 is outstanding (think Netflix), and 10 is terrible. According to NPS Benchmarks, consumer-focused banks earn the lowest NPS of any industry. In fact, their average NPS is negative. Banks could still enjoy very generous margins even if they bumped up the interest rate on depositors’ accounts in equal proportion to the increased interest they charge borrowers when the Federal Reserve increases rates. In other words, if the slopes of the two lines in the graph were equal. Where they diverge is a visual representation of the greed and arrogance that fuel banks’ firm belief that they can get away with taking as much as possible, in plain sight of the consumers they’re consciously short-changing. So now let’s connect all of this to Wealthfront and the 2.24% APY interest rate on the Wealthfront FDIC-insured Cash Account. The fact that we get for you what banks could offer you but won’t is both a matter of choice — we actually believe in building an environment wherein our clients feel like people and not resources to be drained for profit — and a product of our business model. One tremendously valuable aspect of Wealthfront being software-based is that we’re able to pass along most, if not all, of any potential rate increase in the future. It also means that the rates on Wealthfront accounts will drop if overall interest rates drop in the future, but that is highly unlikely to happen for quite a while based on expectations set by the Federal Reserve. Even then, our rates should remain much higher than what you’ll find at the average bank. When it comes down to it, having an interest rate on our cash accounts that’s so high it begs explanation isn’t an accident or a fluke — it’s a direct result of the values that drive Wealthfront as a whole. We want you to have your money right where you need it as part of your investment planning, and we want it growing as fast as possible. And if we had to guess, we would say this is far from the last time we’ll surprise everyone with how our business decisions prioritize our clients’ bottom line in a way that banks never have and likely never will. This blog has been prepared solely for informational purposes only. Nothing in this material should be construed as a solicitation or offer, or recommendation, to buy or sell any securities. The Annual Percentage Yield (APY) for the Cash Account is as of March 20, 2019, and may change at any time. The national average according to Bankrate: 0.10% APY, as of March 20, 2019. Cash Account is offered by Wealthfront Brokerage LLC (“Wealthfront Brokerage”), a member of FINRA/SIPC. Neither Wealthfront Brokerage nor its affiliates is a bank. The cash balance in the Cash Account is swept to one or more banks (the “program banks”) where it earns a variable rate of interest and is eligible for FDIC insurance. FDIC insurance is not provided until the funds arrive at the program banks. FDIC insurance coverage is limited to $250,000 per qualified customer account per banking institution. Wealthfront Brokerage uses more than one program bank to ensure FDIC coverage of up to $1 million for your cash deposits. For more information on FDIC insurance coverage, please visit www.FDIC.gov. Customers are responsible for monitoring their total assets at each of the program banks to determine the extent of available FDIC insurance coverage in accordance with FDIC rules. The deposits at program banks are not covered by SIPC. Investment management and advisory services are provided by Wealthfront Advisers LLC, an SEC registered investment adviser, and brokerage related products, including the cash account, are provided by Wealthfront Brokerage, a member of FINRA/SIPC. Wealthfront Software LLC (“Wealthfront”) offers Path, a software-based financial advice engine that delivers automated financial planning tools to help users achieve better outcomes. Certain information in this blog have been obtained from third-parties that is believed to be reliable, but we cannot guarantee the accuracy and completeness of that information. Wealthfront, Wealthfront Advisers LLC and Wealthfront Brokerage are wholly owned subsidiaries of Wealthfront Corporation.